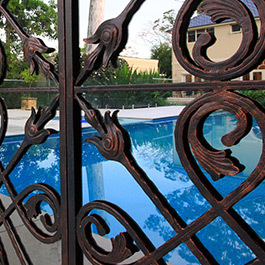 We design and sell beautiful wrought iron elements to style your home. Outdoor mirrors, Trellis wall features, Wrought iron gates and Security doors that will transform your home, garden or courtyard into a stunning outdoor space for elegant living and entertaining. You're creating an extraordinary home. Let us help you step away from ordinary and create something extraordinary in your outdoor spaces. Transform your garden, courtyard or balcony into an eye-catching outdoor space with Rivas Design wrought-iron garden accessories. From Outdoor Mirrors to Trellis Wall Features and Wrought-Iron Gates, our Garden Accessories help you create the perfect space in which to kick back and relax or entertain friends in elegant surroundings day or night.